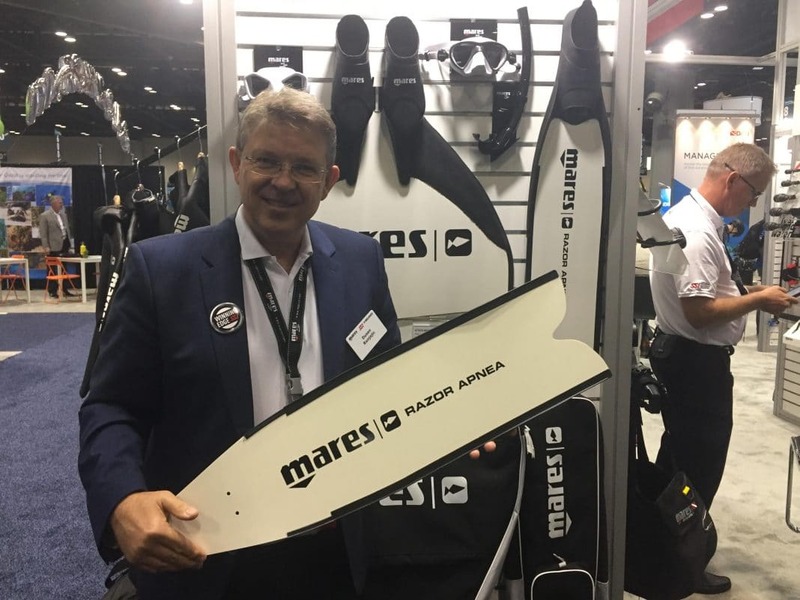 Mares is introducing a new line of fiberglass freediving fins called the Razor Apnea at this year’s DEMA Show in Orlando, Florida. The fins are designed to be more reactive in the water, as well as provide the freediver with a better ratio of energy to propulsion. As opposed to carbon fiber fins, which are highly popular among freedivers but offer a stiffer blade while diving, these fiberglass Mares fins are incredibly flexible due to the “prepreg” pressing of the material. “Prepreg” is a common term for a reinforcing fabric that has been pre-impregnated with a resin system. This type of dedicated technology allows Mares’ Razor Apneas to bend beyond the normal boundaries of freediving fins. The blade is about 20.5cm/8 inches wide and 65cm/25.5 inches long, with a 22-degree blade inclination relative to the foot pocket which allows this fin to be more hydrodynamic in the water. The Razor Apnea fins will be available at the start of 2018, and retail for US$400/344 Euros.